Dragon Con 2002 was held in its usual US location in Atlanta, Georgia, from August 30 to September 2. There were the usual people dressed in costumes ranging from storm troopers of Star Wars to strange silver guys from Battlestar Galactica to characters from SCI FI and fantasy that few have heard of. There was the usual gaming room with over 400 tables for free role playing, card games, and Hero Cliche type games all with judges. There were the usual costume contests and debates on obscure Sci-Fi topics. 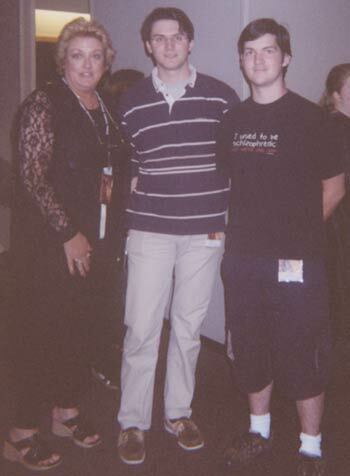 Included were the usual seminars and question-answer sessions with prominent writers such as Timothy Zahn and Michael A Stackpole (whom we met and spoke with). There was the usual merchant room with hundreds of merchants from different companies selling books, costumes, movies, swords, clothes, light up lightsabers, and more "doo dads" then you know what to do with. However, what was not usual at this years, Dragon Con was the presence of the Star Wars Combine! 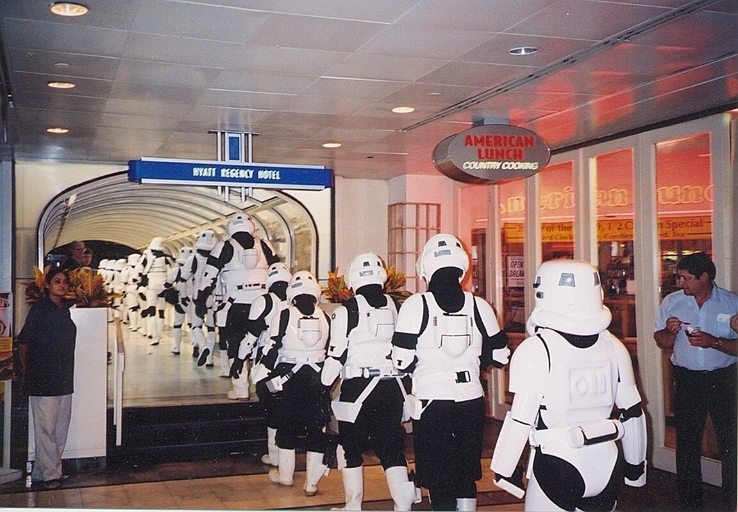 Each day around noon, long lines of Imperial Troopers could been seen at all the snack vendors and restaurants. Officers do not eat with the troops. 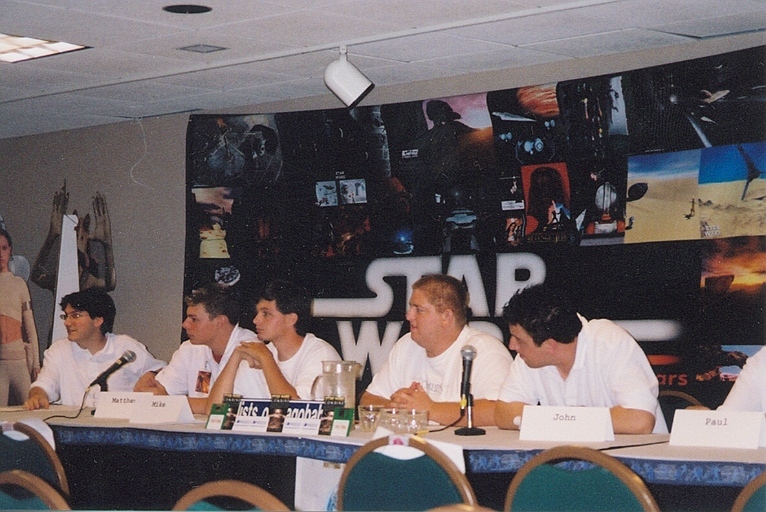 Veynom, PaulDaJedi, Brosk, Gabby Storm, Anti Tarkin, Blackthorne, and Vortex Shard, were all in attendance this year. There was a talk given by them on how to create a villain in an online game, which quickly turned into a discussion on the Star Wars Combine. People just couldn�t get enough of it. Many questions were asked about all aspects of the Combine, how to join and how it works were especially prominent. The rest of the convention was spent meeting new people and spreading the word about the Star Wars Combine to other Sci-Fi fans, as well as partaking in a few of the activities to be had. The Combine at work during the main presentation. From left to right: Veynom, Vortex Shard, Blackthorne, Brosk Cardassian, Anti-Tarkin. There was also Pauldajedi and Kammy in attendance who unfortunately are not in the picture. Blackthorne and Brosk Cardassian having fun in the gaming room. Brosk and Blackthorne spent a good amount of time in the gaming room, picking up some new games and participating in a few tournaments. They then came back with enough swords from the dealers room to defeat a Roman legion. PaulDaJedi, Veynom and Anti Tarkin spent the majority of thier time making laps of the entire convention and trying to see all that was to be seen. Sitting in on some panels, and buying a few items as well. Gabby Storm, a guest speaker durring the convention spent much of her time on panels or as a judge in competitions, though would always make time to hang with the members of the Combine. Vortex Shard spent most of his time as a judge in the gaming room deciding the fates of tournament players. 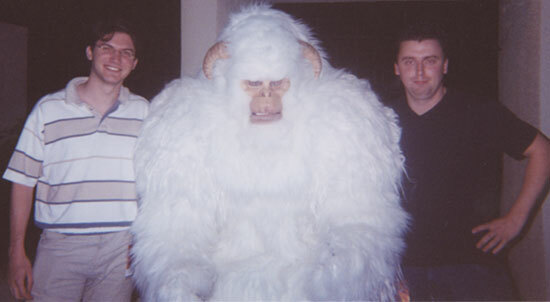 Veynom and Anti-Tarkin were lucky enough to tame a Wampa. The presence of the Combine at Dragon*Con raised a lot of interest among the Star Wars fans and the presentation was a success. We think most of us will be returning to Dragon Con again next year, as we know we are a start a much bigger Combine showing. We hope everybody will help the Combine by coming.